Introduction and "Love is Our Cross to Bear"
"Plan was to walk around the pond - or - in case of rain - eating and shopping. then we figured out we could do all three! 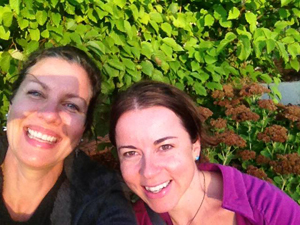 Happy girl time with meg." 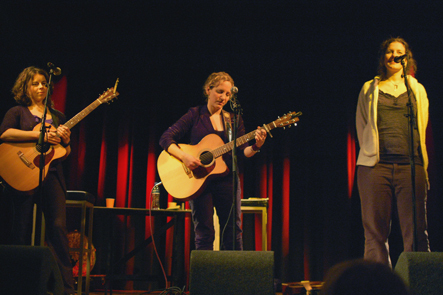 Antje Duvekot and Meg Hutchinson - "Gypsy life"
Winterbloom went to Germany after the Paradiso concert and at the Music Star in Norderstedt Hans Jürgen Hiller, Günter Neitzel, Thomas Niehaus and Wolfgang Sedlatschek recorded this nice video. Sweet Spot is an Antje Duvekot song. I can recommend Antje Duvekot her latest CD's 'Big Dream Boulevard' (released in 2006) and 'The Near Demise of the High Wire Dancer'. John Gorka is singing harmony vocals on three tracks. (released in 2009). Meg Hutchinson her latest two CD's 'Come Up Full' (2008) and 'The Living Side (2010)' were released on Red House Records, and I think they are wonderful! 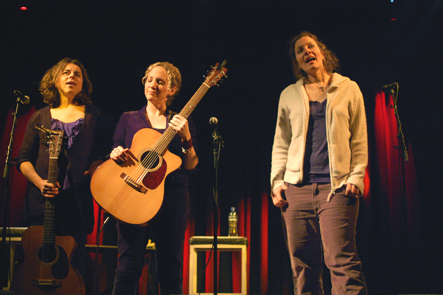 Winterbloom released an 8-song EP entitled "Winterbloom: Traditions Rearranged" which received major media attention. On the album (and in the show) they perform new arrangements of traditional holiday songs alongside their own originals and special winter/holiday songs they wrote just for this project. when i was 17 i was lost. things were strange at home. things were strange at school. having grown up in germany, i was now going to high school in greenville, delaware. i couldn't make sense of the kids at school. their behaviors seemed impossible to decode. in germany i was normal. i knew what i was doing. now i didn't. i longed for my language and my culture and my friends from before. things were strange at home, too. so i lived in between. in the space between home and school. i walked and i walked around the suburbs. my discman taking me far away. i listened to the music of john gorka. i can't say i understood the lyrics, really, but i understood the voice. his warm baritone wrapped itself around me like a shield. i'm not sure how i would have made it through those years without that shield. fast forward 20 years. i am on tour with john gorka, the man. he is just a man. it is just a gig. he does what i do for a living and i know - as i am an insider - that there is no real magic there. i know all this but my heart says otherwise. 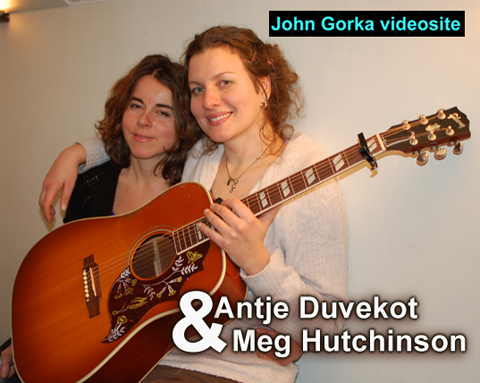 John Gorka's Mother's Day Concert (with Antje Duvekot). genesis of my dream. john gorka has come full circle too. we are playing at Godfrey Daniels, Gorka's stomping ground. the place where he cut his teeth. where he had his heroes. and so it goes. i am not sure any of us would be doing what we do if it weren't for our heroes and the gifts they gave us. this is my "full circle moment" but it is not that of the crowd and so i aim to conceal the monumental weight this event holds in my heart, but on the inside me, old me, present me, myself and i are beaming... maybe you can spot it on our face :) .